Thick clouds from bad weather make for beautiful, if frustrating, scene over SpaceX's launch site at the Cape Canaveral Air Force Station in Florida. The weather delayed SpaceX's planned launch of the U.S. Air Force's new GPS 3 SV01 navigation satellite on Dec. 20, 2018. SpaceX postponed the launch of a new GPS navigation satellite for the U.S. Air Force today (Dec. 20) due to dismal weather over the mission's Florida launch site. 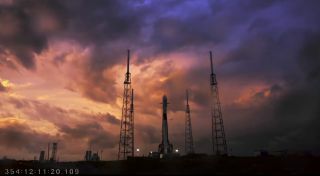 The private spaceflight company hoped to launch the advanced GPS III SV01 satellite on a Falcon 9 rocket at 9:03 a.m. EST (1403 GMT) after two days of delays due to a sensor issue on the booster. But foul weather, including thunderstorms, rain and potentially even hail, made a launch attempt untenable. It came as no surprise to SpaceX: Weather forecasts put the chances of good launch conditions today at a meager 20 percent. SpaceX is now aiming to launch the GPS III satellite on Saturday (Dec. 22), with liftoff scheduled for 8:55 a.m. EST (1355 GMT). Today's weather scrub marks the third day of delays for SpaceX's GPS III mission. The Hawthorne, California-based company first attempted to the launch the navigation satellite on Tuesday (Dec. 18), but a sensor issue forced SpaceX to stand down for two days as to analyze the issue. By late Wednesday, SpaceX was ready for another try, but the weather turned sour. Vice President Mike Pence attended SpaceX's Tuesday launch attempt, and used the occasion to unveil the Trump administration's plan to form a new U.S. Space Command to oversee all military operations in space. Delays are fine, Pence said, so long as the GPS III satellite makes it to space safely. "The most important thing is that we get that rocket up safely and securely, and achieves its mission," Pence said in a speech at NASA's Kennedy Space Center near the launch site after the scrub. "I know this bird is going to fly, and when it does it's going to make a difference for the security and prosperity of the American people." Built by Lockheed Martin, the GPS III SV01 is the first of a new constellation of ultraprecise navigation satellites for the U.S. Air Force. The satellite is nicknamed Vespucci after Amerigo Vespucci, the namesake of the Americas. Editor's note: This story was updated at 11:29 a.m. EST to include the new launch target for SpaceX's Falcon 9 rocket.